Bhagwan Swaminarayan in his teenage form of Nilkanth Varni went from Badrinath to Mansarovar and back, trekking these Himalayan heights in the inhospitable winter months. The journey from Badrinath to Mansarovar and back took him six months, during which he spent February in the –25 degrees Centigrade (-13 Fahrenheit) cold environs of the 15,000 feet high Lake Mansarovar, including a six day parikrama of the Lake. The low oxygen does not support any vegetation here, and Nilkanth performed his austerities without food or water, fasting for all these months. 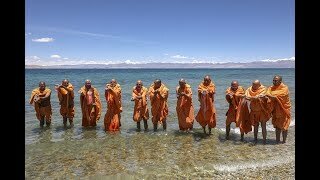 On this sacred sanctified land, a small group of sadhus and devotees visited Mansarovar for the Asthipushp Visarjan of Pramukh Swami Maharaj’s ashes, in June 2017. On the first day, 11 June 2017, along with prayers and meditation, the sadhus performed Nilkanth Varni’s Murti’s abhishek in the sacred Mansarovar waters. 12 June 2017 was a special day on which many rituals were performed with due ceremony on this sacred land. 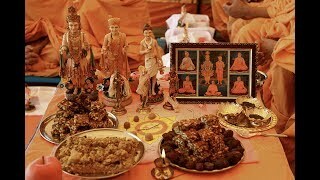 Asthipushp Pujan of the ashes of Bhagwan Swaminarayan and Pramukh Swami Maharaj, a Mahapuja for three hours, ‘Paath’ (recitation) of the Janmangal Namavali, Swaminarayan Dhun, Arti of Bhagwan Swaminarayan and the Guru Parampara and a small Annakut – all of these rituals were performed with utmost devotion on the banks of Lake Mansarovar, in a location with a clear view of the majestic Mount Kailash. After the previous day’s pujan, on 13 June 2017 – exactly ten months after Swamishri’s passing away, his Asthipush were ceremoniously and respectfully lowered into the sacred waters sanctified by Nilkanth Varni over two centuries ago. The 12 sadhus and 8 devotees lowered Pramukh Swami Maharaj’s asthipushp into Lake Mansarovar with prayers to Bhagwan Swaminarayan and the Guru Parampara, while remembering HH Mahant Swami Maharaj and his blessings for this special journey in the footsteps of Nilkanth Varni.